Everyday Carry, What do You Have in Your Pockets? Everyday carry is a very personal thing; it can depend on where you live, the weather and the laws on concealed carry. In writing this article I am going to describe what I carry and why. I probably have too much stuff in my everyday carry. My wife laughs at me all the time because I wear pants with cargo pockets most of the time and they are usually full of stuff and look baggy. Sometimes I wish it was cool for men to carry a purse or similar bag, so I could carry more junk. Any suggestions? Currently I carry both an older Gerber Multi-tool and a Leatherman Wave. I have carried both for years. I took a look at the new Gerber’s on the internet and the closest I saw to the one I carry is the 600 multi-pliers. You may wonder why I carry two multi-tools, well it always seems like I am loosening a bolt or nut and need tools to hold both ends. Also, I have found that the different shapes of the pliers are handy. For a knife, I carry a Benchmade Osborne model 530V with the tanto style tip. This has been a good knife and has held up under some rough usage. 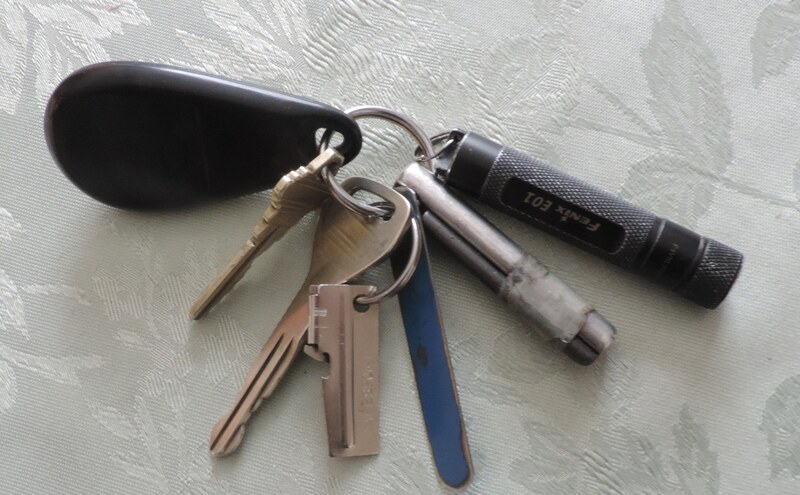 On my key chain are a small magnesium block and a ferrocerrium fire starter, a p38 can opener and a small flashlight, a Fenix E01. 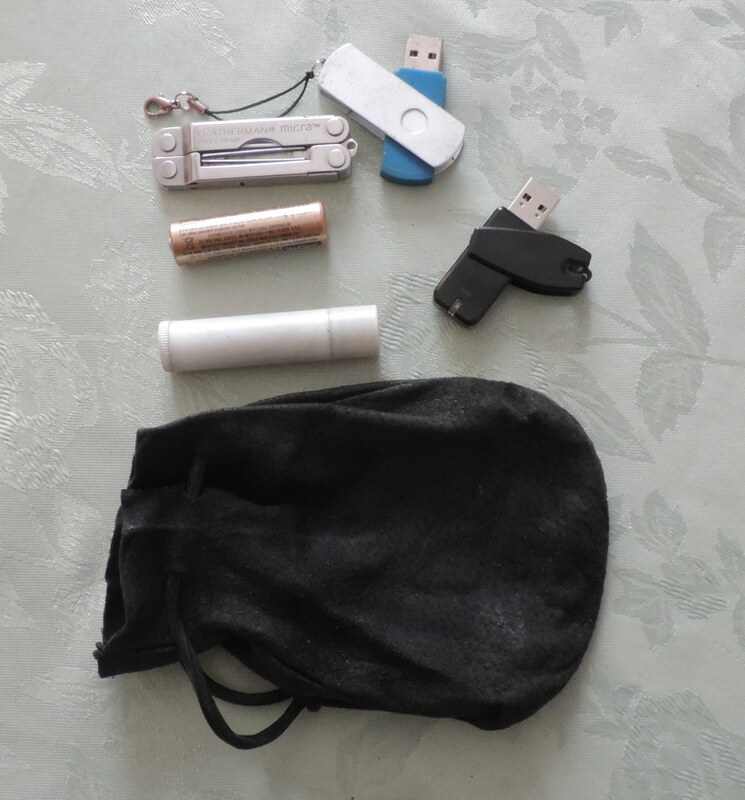 In my other pocket, I carry a small leather pouch that contains two thumb drives of information that is important to me, a spare battery, Chap Stick and Leatherman Micro. In addition, I usually have a Fenix LD10 and a cell phone with me. This has worked well for me over the years. 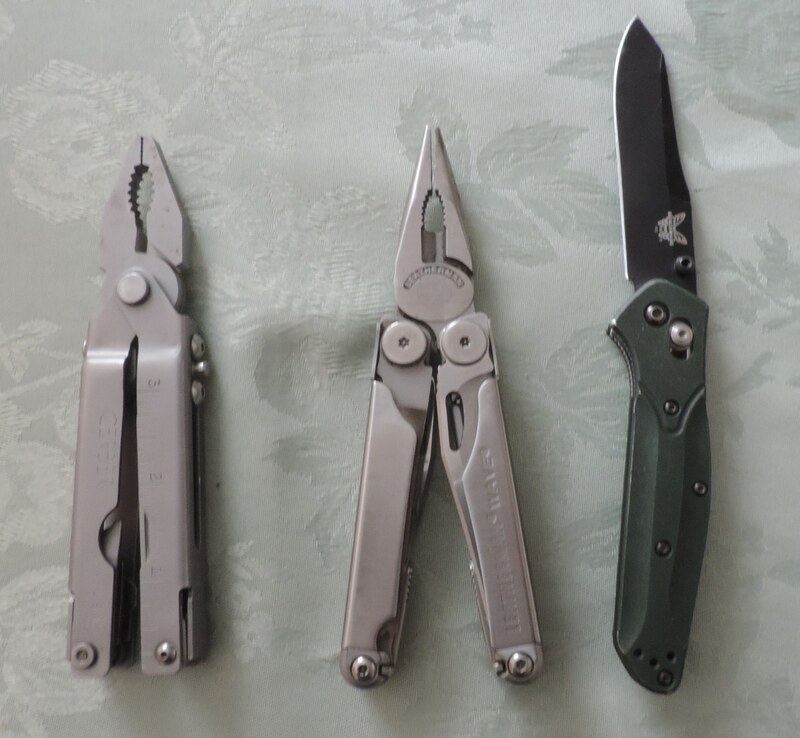 I know it seems like a lot of knives and multi-tools, but I seem to always be using one and the different types and shapes work well. Never a day goes by that I have not used at least one of them. If I am going hiking I often slip a Lifestraw or similar water filter in my pocket. I can usually find surface water, where I hike, if my water bottles run dry. Hope this gives you some ideas for your everyday carry. This entry was posted in survival, tools and tagged everyday carry. Bookmark the permalink. 7 Responses to Everyday Carry, What do You Have in Your Pockets? Ditto on the two multi-tools. I carry and recommend aspirin, ibuprophin and acetaminophin, as well. Aspirin is particularly important in the event of a sudden cardiac event. Two Bic lighters and a jewelers loop, a small whistle complete my kit. A courier’s bag and back pack stay in my truck containing seasonally appropriate clothes, paracord, water filter, high calorie food, roll of 6 mil plastic and various other equipment useful for short or long term survival. Peace of mind, come what may. In the event of a sudden cardiac event Cayenne Pepper powder is a much better choice. Cayenne powder mixed into a glass of water and drank will most times STOP a heart attack within seconds. Can you show me some actual science to back that up? Also, have you ever dealt with someone having an actual Cardiac Event? It’s hard enough to administer nitro or aspirin, let alone have them drink a glass of hot pepper. If it works, then I’m 100% for it- but I have looked and can’t find any reputable sources that agree. I really don’t think about it anymore. I went to visit friends 2 weeks ago and someone I know came into the shop and started hassling me.. he’s another old friend. He then said what ya carry. Again this is stuff I just had on me at the time. and items to get me home, winter boots. and a nice folding mountain bike, batteries for my flashlights. random stuff like fixaflat water food tp, antifreez/oil.. more clothing. 2 N100 particle masks and much more. I have at least a month of food (survival bars) in my van.